How often have we heard those words, but not actually got to read the Charter before it is returned to its safe repository? Well, for those of a curious nature, a transcription is below, it is worth reading the original displayed in the Lodge as the transcription below is not 100% accurate, the original appears to contain a few errors and some may have crept in while transcribing. The said lodge to meet at the Duke of York Hotel, York Town in the county of Surrey on the last Wednesday of every month empowering them in the said Lodge when duly congregated to make pass and raise Free Masons according to the Ancient custom of the Craft in all Ages and Nations throughout the known World. 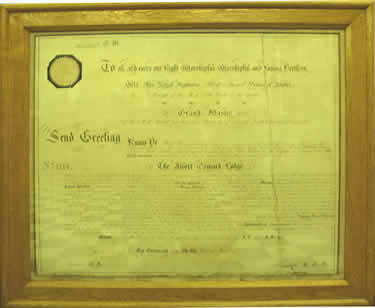 And further at their said Petition and of the great trust and confidence reposed in every of the above named Brethren We do appoint the said Henry Hacker to be the first Master, the said James Mount to be the first Senior Warden, and the said William James Lendrim to be the first Junior Warden for the opening and holding of the said Lodge and until such time as another Master shall be regularly elected and installed strictly charging that every Member who shall be elected to preside over the said Lodge and who must previously have duly served as Warden in a Warrented Lodge shall be installed in Ancient Form and according to the Laws of the Grand Lodge that he may thereby be fully invested with the dignties and powers of his Office. And we do require you the said Henry Hacker to take special care that all and every the said Brethren are or have been regularly made Masons and that you and they and all other the Members of the said Lodge do observe perform and keep the Laws Rules and Orders contained in the Book of Constitutions and all others which may from time to time be made by out Grand Lodge ot transmitted by us or our Successors Grand Masters or by our Deputy Grand Master for the time being. And we do enjoin you to make such By Laws for the government of your Lodge as shall to the majority of the Members appear proper and necessary the same not being contrary to or inconsistent with the general Laws and Regulations of the Craft a copy whereof you are to transmit to us. And we do require you to cause all such By Laws Lodge to be entered in a Book to be kept for that purpose. And you are in nowise to omit to send to us or our Successors Grand Master or to Our Deputy Grand Master for the time being at least once in every year a list of the Members of your Lodge and the names and descriptions of all Masons initiated therein and Brethren who shall have joined the same with the fees and monies payable thereon. It being our will and intention that this our Warrent of Constitution shall continue in force so long only as you shall conform to the Laws and Regulations of our Grand Lodge. And you the said Henry Hacker are further required as soon as conveniently may be to send us an account in writing of what shall be done by virtue of these Presents.